We live in a world where most operating systems can be navigated with a few clicks, taps, or swipes. To many, Linux seems almost to hail from another century, perhaps even another civilization. Small wonder that even some Linux administrators have trouble keeping all the commands and language they have to use in their day-to-day. That’s where cheat sheets come in. These reference cards, documents, and apps generally list out the most common, most valuable, and most important commands. Rather than having to search through a directory or rack your own brain, you can know exactly what you need to use at a glance. Awesome, right? And there’s plenty to choose from, too. Here are a few of the best – if you know of one that you think deserves to be on this list, give us a shout in the comments! Our first entry on the list is a bit more comprehensive than some of the other cheat sheets. Commands are organized into thirteen different sections based on what they do, and the white-on-black color scheme is designed to be easy on the eyes. Better yet, if the basic command list isn’t quite enough for you, there’s a more detailed breakdown of each command on Linoxide’s website. This one’s probably my personal favorite…since it’s not actually a cheat sheet in the traditional sense of the word. It operates within the Linux command line. Using the ‘cheat’ command, you’ll be able to access a full list of other commands, and even search for specific parameters. The Unix Toolbox offers a list of Unix, Linux, and BSD commands geared towards IT and advanced users. It’s probably a little confusing if you don’t know what you’re doing, and novice users should stick with one of the other guides in the list. 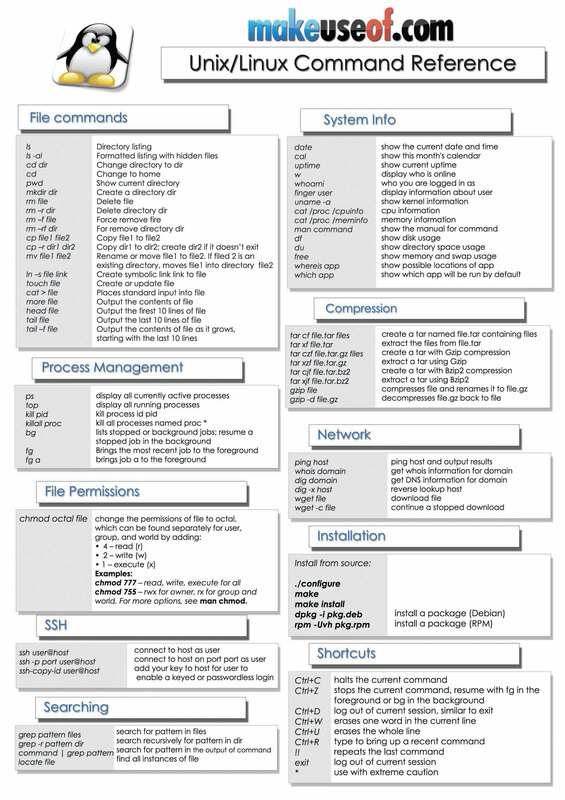 Courtesy of Make Use Of, this cheat sheet’s geared more towards general users than sysadmins. It features Linux commands that everyone’s likely to use on a daily basis. It’s organized in a similar fashion to Linoxide’s cheat sheet. Pretty much exactly what’s written on the box, here. The One Page Linux Manual is a reference guide to the most popular, most frequently-used Linux commands. This one’s a great resources for novices, but probably too basic for more veteran users. More of a tutorial than a straight cheat sheet, Learning Unix In 10 minutes lists a concise breakdown of every important command you’ll use in the UNIX command line. It’s worth a read even if you know your way around Linux, to be honest. Who knows? You might learn something. Like Learn Unix In 10 Minutes, Learning The Shell is more of a tutorial…but it’s no less valuable for it. If your aim is to learn more about the Linux command line, you’ve definitely come to the right place. There’s even a link to a book that provides a more comprehensive guide. This one’s pretty awesome – it lets you look up commands via a search function which are displayed according to Unix version. Although available as a PDF, we strongly recommend using the web-based tool, instead. It’s a lot more convenient than having to search through a table. Created with administrators in mind, this quick-and-easy reference file encompasses all the basic Unix commands within the Unix Shell. It also includes the most common parameters associated with each. It’s available as both a printable PDF and an online resource. We’ll leave the list off with another simple, quick-and-dirty cheat sheet. There’s really not much else to say about this one – but we recommend checking out some of the other reference sheets and guides on the site that hosts this one. There’s an Agile Development and HTML5 Cheat Sheet there, as well. ← What Does The 2015 State Of The Sysadmin Survey Say About Your Career?